Mobile ad blocking installs just spiked 3X in the last three months. But who is installing ad blocking browsers and apps? And why? A little slice of everyone, it turns out. Based on the data collected in our recent survey of almost 4,000 smartphone owners in North America and Europe, it’s clear that there’s no one single demographic group is blocking ads on mobile. Rather, it’s a little chunk of everyone, from teens to adults, women to men, and Americans to Europeans. Young to middle-aged adults block ads on mobile just a bit more than others. But clearly, even those aged 65+ have installed apps or browsers that can block ads in some cases — or had them installed by others. Interestingly, teens are the least likely of any age group to report having installed an app on their smartphones to block ads. That’s surprising for a number of different reasons, including that teens are both a heavily marketed group and that they are, on the whole, fairly technically savvy. Women tend to block ads a little less than men, although the differences are fairly minor. 28.6% of men report having installed one more more mobile ad blocking apps, while 22% of women claim the same. 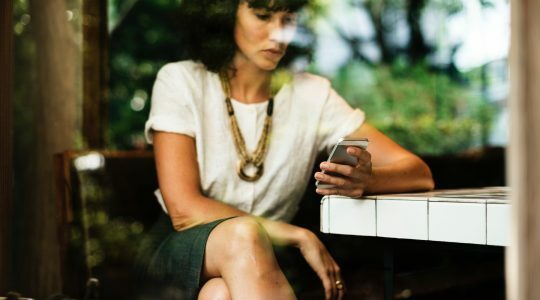 Interestingly, while just under 18% of men say they’re “not sure” whether they’ve installed a mobile ad blocking solution, 24% of women are unsure as well. 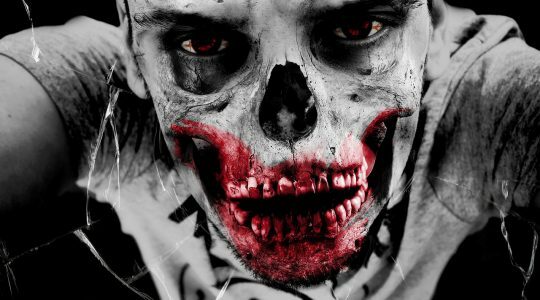 Traditional gender differences may play a role here, as men might be less likely to publicly admit a lack of knowledge. Android users tend to block ads more frequently then iPhone owners. 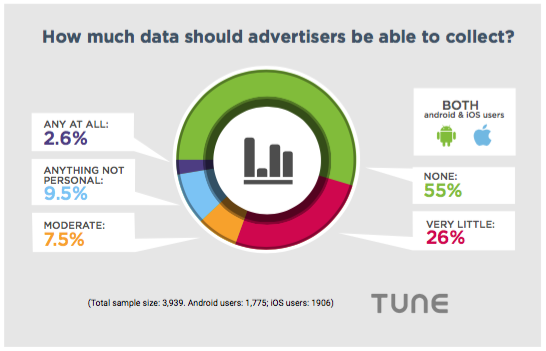 27% of Android owners say they’ve installed ad blocking apps, but only 22% of iOS users. A caveat here: we could only gather European data from the UK. Other nations such as Germany are generally more privacy and security conscious than the British, so it’s likely our European results would be higher if we had gathered more data from a larger number of countries — something for us to address in a future research effort. 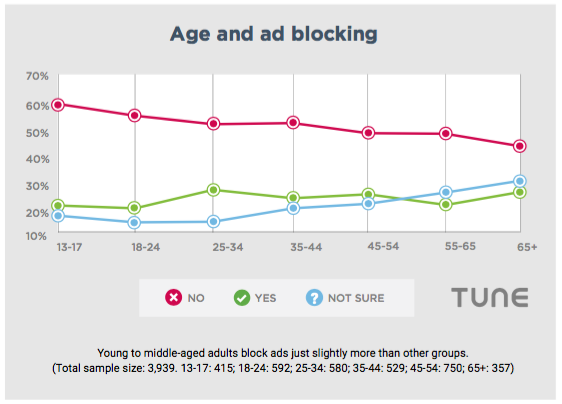 When it comes right down to it, the ad blocking cohort is an almost perfectly representative demographic slice. While ad blocking mobile users skew slightly to young and middle-aged adults, men, Android users, and Europeans, there really aren’t many huge, standout defining demographic differences. Instead, the more likely indicators of ad blocking behavior are technical proficiency and concern over mobile user experience or privacy. So why are people installing ad blocking apps on their smartphones? A common fallacy about people who block ads is that they are paranoid about advertising, privacy, and being tracked. For a significant percentage of people, that’s not the case at all. All those calls take time, and take data. When the New York Times studied this in late 2015, one example mobile site took 33 seconds to load without an ad blocker, and only 7 seconds to load with one enabled. That’s a significant performance jump. While performance is a real concern for many mobile users, privacy, of course, is still a big issue. About half of mobile users are concerned enough about digital privacy to say that advertisers should not be able to collect any data about them. The data that these users worry advertisers are collecting ranges from the perfectly reasonable, such as general location, and type of mobile device they are using to the fairly paranoid: credit card number, banking details, and personal photos. An interesting category is those who prefer to block ads because they are concerned about data usage. In the New York Times example above, the mobile page weighed in at a staggering 16.3 MB without an ad blocker, and a somewhat more svelte 3.5 MB with one. 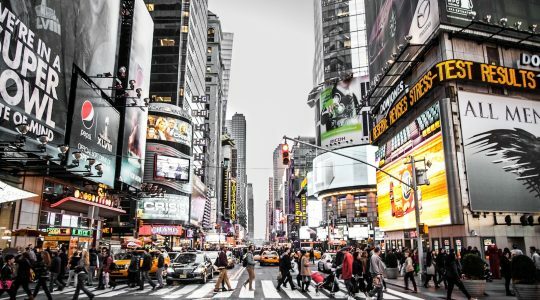 For people on a data budget, and particularly for users in developing nations or countries where mobile data is expensive, this can be a very big incentive to block ads. A recent Adobe study found that ad blockers reduced data use by about 50%. For people who are paying for their data use with limited funds, that’s a powerful incentive. For more details on mobile ad blocking, please see our free report. If you’re currently using a mobile ad blocker, tell us why in the comments. Or … if you’re a marketer or advertiser and have serious concerns about ad blocking, let’s discuss what you’re doing about it.